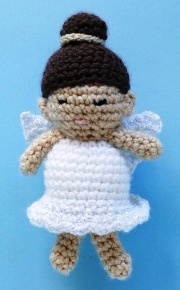 An adorable little angel doll for Christmas, in a traditional amigurumi style. The picture shows the eyes stitched on, but I think little black doll's safety eyes would look much cuter. - and the mouth needs a darker pink or red to show up properly.